From Mountain Pine to Your Morning Drive Bobby Estell, now known to music lovers all over the country as Bobby Bones, spends his days on the microphone entertaining millions with The Bobby Bones Show. His nationally syndicated morning radio program is the most popular country music show in America, beloved for the witty talk among Bobby and his cohorts; the easy, everyman rapport he has with stars like Carrie Underwood, Garth Brooks, and Jason Aldean; and his ability to stay true to his roots and where he came from. Where Bobby came from is the fuel that drives him-that ""Fight. Grind. Repeat."" mantra that makes him one of the busiest guys in the business. Raised by an alcoholic single mother who often resorted to shoplifting to put food on the table and by a grandmother who taught him to shop garage sales, play poker, and love music, Bobby spent his childhood in the hills and trailer parks of Mountain Pine, Arkansas; his is as simple a story as it gets. But Bobby wasn't going to settle, and when he got his first radio as a birthday present, he focused his mind on getting on the air and beyond. From Arkansas to Austin and eventually to Nashville, Bobby Bones has created the show he always dreamed about, one where he gets to do the thing he loves while hanging out with his friends. 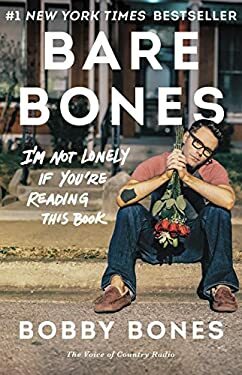 Full of stories from his childhood, his brushes with the best and the beautiful of music-hint: not all of them like him (oh well)-the hijinks and moments of real danger that have been a part of his journey, and the self-deprecating humor that only Bobby Bones could bring, Bare Bones is a heartfelt, funny, and honest tale of someone who has truly lived the American dream. People ask me all the time how I got into radio, and I'm always happy to tell the story because it's a testament to the fact that to make it, you don't have to know someone in the biz; have a friend who knows someone in the biz, or have a cousin whose mailman's uncle knows someone in the biz and owes your cousin a favor. All I knew was what I wanted to do, which was be on the air. And I was going to take any job that would lead me to getting to that spot. I didn't have any connections to radio, only passion. I had decided that radio was my calling after my fifth birthday when my aunt Cindy bought me a small radio. But that wasn't the only present. She had the local station's DJ say ""Happy Birthday to Bobby Estell."" And from that moment on I knew that I was going to be that DJ on the radio.